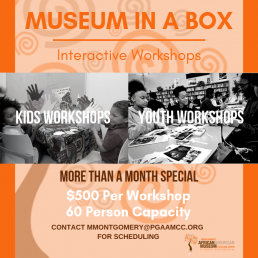 Bring our museum to your classroom! Trained museum educators will come to your school to conduct an interactive historical workshop. Through the examination of historical artifacts and arts and crafts, students will gain a deeper knowledge of African American history in Prince George’s County. A Space of Their Own: Experience the history of Prince George’s County’s historically Black Townships. Coming Home: The Story of African Americans in WWII and how they shaped community life in Prince George’s County.